The former Borrego Valley Foods store, a mid-century modern building prominently located on Christmas Circle in Borrego Springs, has been purchased by the Borrego Art Institute for a new gallery featuring plein air desert artists. With Borrego’s vast desert wilderness, the Institute’s commitment to plein air painting and a significant modernist building—look for this to become a destination for artists and fans of California Impressionism. The building was designed in 1949 by La Jolla architect William Kesling, known for his Streamline Moderne style. For the renovation, the Institute enlisted award-winning architect Richard Orne–formerly of LA and now a Borrego resident. Workers tore out the old market’s ceiling and gutted the interior last October. “We’re moving along rapidly,” says board member Kay Levie, with a planned completion by October, 2012, and a grand opening around the first of the year. Watch the organization’s website for updates: http://www.borregoartinstitute.org/. The Institute plans to name the new gallery (a restaurant will be included in the space) for a major donor. Arts patrons are officially invited to vie for the honor. JUST DOWN BORREGO SPRINGS’ MAIN STREET from the under-construction gallery is the Borrego Desert Nature Center, home of the Anza-Borrego Desert Natural History Association and a well-loved, long established center for desert natural history and art. 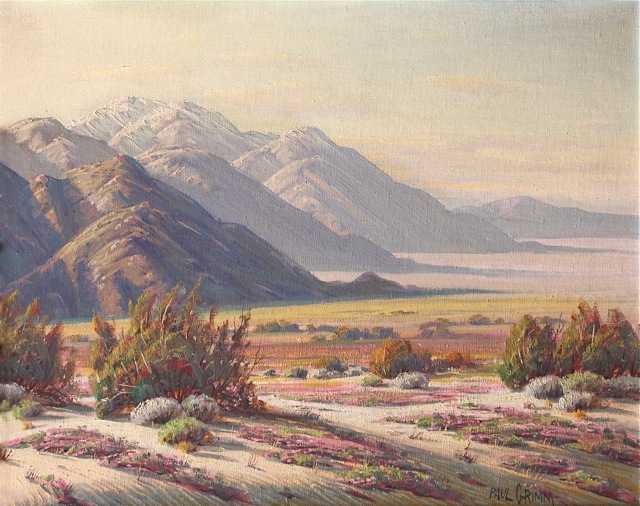 Hanging on a wall of the Center is a classic Paul Grimm painting of Palm Springs’ dunes and verbena. The owner, Association life member Nick Spain, is selling the painting with a portion of the proceeds to benefit ABDNHA. In this case, the painting came from a retired professor of archaeology, Nick Spain, who lives in Santa Ana, in the same house where he grew up. He knew his neighbor Lova Millard his entire life. Millard was a schoolteacher beginning in 1918 and an early botanist and naturalist who hung out in the desert with friends like natural history writer Edmund Jaeger and artist Paul Grimm. 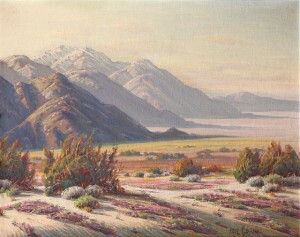 Grimm personally gave her the painting titled Winter on the Desert. “I treasured the painting for years and now it’s time to pass it on,” Spain says. For the next owner of this painting, I suggest taping Spain’s story to the back so Lova Millard, Paul Grimm, Nick Spain and early Palm Springs are never parted. Scene description: Landscape; looking north across wildflower covered sand dunes along eastern escarpment of Santa Rosa/San Jacinto mountains. Is the Grimm painting still for sale? Thanks! Richard, The painting was still available as of Dec. 19, 2012. Please check with the Anza-Borrego Desert Natural History Center. Is this Paul Grimm still for sale? The Paul Grimm in Borrego is sold, unfortunately. The Galleria at the Palms at Indian Head (in Borrego) is having a big show and sale of early desert art, opening Feb. 24th, 2013. They have at least one Paul Grimm. I’ll post a news item on that sale in the next few days. Hello. @Richard Roger and Jean Hoover, I have two Paul Grimm paintings that I have decided to sell. If you’re interested in possibly purchasing one or both of them, send me an email to jane_slzr@yahoo.com. I Have a Paul Grimm painting 16×20 dated 1938. I Have an original Paul Grimm painting 16×20 dated 1938. I am interested in purchasing a Paul Grimm painting. Please contact me if you have one for sale.858.967.1897 or ddeluckyme@gmail.com! I have a Paul Grimm painting that I would like to sell. The title is “Sentinel of the desert” from 1969. Measurements are 48×33 1/2 with frame, and 37×23 just canvas. I have a Paul Grimm painting for sale. The title is “Desert Expanse”. Measurements are 25 1/2 x 35 1/2 original frame, 19 1/2 x 29 1/2 canvas. partly cloudy partly sunny day. Great condition, pictures available. I have a Paul Grimm dessert/mountain scene with beautiful clouds, written on back of canvas is “Desert Contrast” plus his hand written name Paul Grimm. 31×25 canvas size. Origianal frame. Excellant condition. We would like to sell this oil. Please contact Sue at 309-264-1212.
i have 2 Frank Kinney watercolor’s up for sale. One is “cliff side Dwelling” 1981. The other ” Sunrise Reflections” from 1984. I have a large Paul Grimm Seascape for sale. I have two Paul Grimm paintings inherited from an Aunt. I have no idea of their value. Where should I start? I am an art broker and have clients who buy and sell Paul Grimm and many other artists to include Southern California art. I currently have a client with a Paul Grimm and a few other California artists and another with an original Whistler etching. Please contact me if you wish to buy or sell.